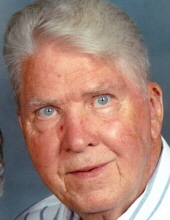 Kenneth W. “Kenney” Barling age 91 of Bloomington, IL passed away at 10:05 AM on Tuesday, February 5, 2019 at Heritage Healthcare, Bloomington IL. His funeral service will be 11:00 AM Friday, February 8, 2019 at Calvert & Metzler Memorial Home, Bloomington, IL with military rites accorded by the Bloomington-Normal American Legion Honor Guard. Fr. David Halt will be officiating. Entombment will be at Park Hill Mausoleum, Bloomington, IL. Visitation will be 9:30 AM-11:00 AM Friday at Calvert & Metzler Memorial Home, Bloomington, IL. Kenney was born February 19, 1927 in Bloomington, IL the son of Fred and Lottie Sayers Barling. He married Carolyn Rae Claudon on May 29, 1949 in Bloomington, IL. She passed away June 19, 2013. Surviving are his 3 children, Marsha (Terry) Anderson, Bloomington, IL, David (Janey) Barling, Bloomington, IL, Alan (Caryl) Barling, Pontiac, IL, 8 grandchildren, Matt (Mary) Anderson, Molly Walls, Jeffrey Barling, Katie (Jeff) Gerald, Scott (Jenny) Lindsey, Carrie Lindsey, Audra (Erik) Anderson, Kate (Justin) Nix and 10 great-grandchildren. Kenney is preceded in death by his parents. Kenney served in the US Army during WW II. He owned operated Kenney’s Delivery Service, Bloomington, IL for many years until he retired. Kenney was a member of St. Matthews Episcopal Church, Bloomington, IL. He was a member of the Bloomington Normal Bowling Association Hall of Fame. Kenney was a avid Cub fan, He enjoyed spending time with his family and especially his grandchildren. He will be missed by all who knew him. "Email Address" would like to share the life celebration of Kenneth W. "Kenney" Barling. Click on the "link" to go to share a favorite memory or leave a condolence message for the family.